What’s the height a cabin crew must have? The questions regarding the height of a flight attendant are very common. Height limits vary from company to company and it represents an elimination criteria. 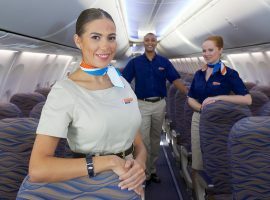 What height should I reach to be hired as cabin crew? Etihad Airways – minimum 210 cm – must reach this height with your arm, barefoot; you can stand on your toes. Qatar Airways – minimum 212 cm – must reach this height with your arm, barefoot; you can stand on your toes. Emirates – minimum 212 cm – must reach this height with your arm, barefoot; you can stand on your toes. Ryanair – minimum 157 cm, 188 cm maximum. Wizz Air – minimum 165 cm for women and at least 175 cm for men. British Airways – minimum 158 cm , 186 cm maximum . Virgin Atlantic – at least 158 cm. If the conditions of employment specify maximum limit and you exceed it you will be disqualified. In general, unless specified, the upper limit is considered to be 190 cm. hi.is nassira from Algeria.i want to be air hotess at Etihad Airway Arabic speakers company.thanks. 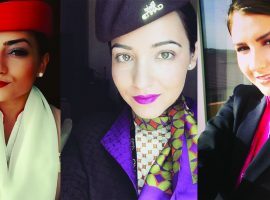 im 5”1 and my dreams to become a cabin crew for Etihad Airways im little scare with height and reach could someone pls give me an ideas of how to reach it ? Hi, in order to boost your chances of reaching their limit you can start stretching, doing yoga or any other sport that can help you grow a little more. Good luck, dear! I want to clarify, in the reach test. Do they ask to use our both arms at same time or one arms only?? You will have to reach the height with only one hand. Wish you good luck!